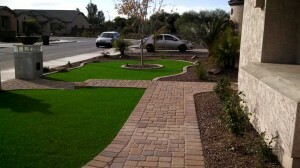 New front yard landscape design revamp in Gilbert, AZ 2013. We took a new house and designed a front yard with some wow factor. The customer had a basic yard but wanted it to be remodeled to match the custom feel of the neighborhood but as low maintenance as possible. We designed an Arizona landscape with a new paver sidewalk to match the existing pavers in the driveway and entrance way and added driveway ribbons on both sides of the existing driveway. We created a grand entrance at the front of the property by adding the sidewalk to the front of the property with a step and pillars at both sides. The pillars have glass block and lighting with wok pots and iron artwork in the pots. They were looking for a green or desert feel to their yard but without all the hassle of grass so we installed synthetic grass in the front. We planted some low maintenance plants that do well in our Arizona sun like palms and ice plants along with some small shrubbery. 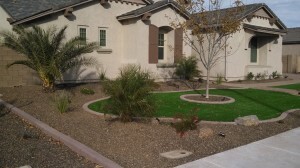 This yard will require very little water and is a great example of a xeriscape Arizona landscape. The owners will not have to do too much trimming or upkeep to keep it looking as pristine as it was when it was installed.